Ahava Emunah Lange manages to meet life's greatest challenges with an upbeat attitude and a sense of humor. Ahava Emunah's family became religious when she was approaching 8th grade, and then made Aliyah before she finished high school. All of these changes taught her to be a better person, and prepared her for the biggest challenge of her life thus far: cancer. Ahava Emunah Lange's journey, though rocky and filled with challenge, has always been one of love, faith, and joy. Though she is battling ovarian cancer, this Ben Gurion University graduate and author of the popular blog "Ma-Ma-Bla-Bla" says of her positive attitude, "When we look at things up close and we can see the small details of the picture, we can see some very drastic things happening along the way. But when we zoom out, I'm able to see the big picture in my life. It's all for the good, but we just don't know how it's all going to pan out." She adds, "I feel very spiritual about my life's journey, and about each and every thing that has happened along the way." This isn't to say the journey has been easy. "I want to be the one who is helping others. It was very difficult for me to accept that suddenly I was unable to provide for my children, for my family...I was led into a position where so many choices were out of my hands and I realized that I don't control anything. We don't control anything in this world except sometimes our thoughts and our actions. This journey has made me very vulnerable and very humble." 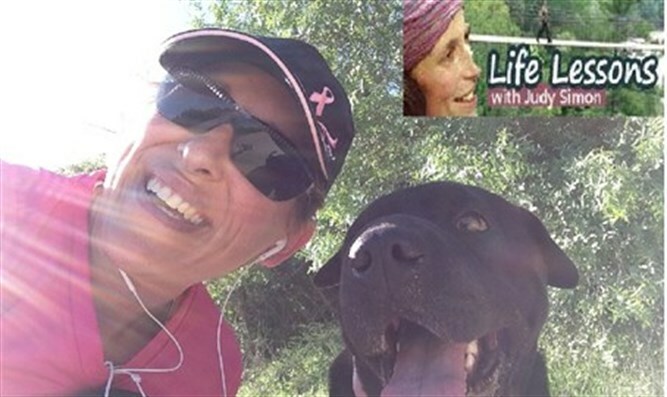 Tune in to meet this sunshine-filled woman, whose inspiring story is matched only by her incredibly positive joie de vivre. While you listen, please remember to say a quick prayer for the full recovery of Ahava Emunah bat Chava Etta.